The Prompt: 1.) 5 things to do in your town during Spring Break. I don't know about you, but I am looking forward to Spring Break this year. An entire week of days off! Who wouldn't love that? We won't be trite and head to the beach, even though it is two hours away in Corpus Christi. The water is still going to be too cold, after all, and everybody and their mother goes to the beach for spring breaking. Larry and I share an intense dislike of crowds, and my college years are not so far behind me--I remember exactly what college kids tend to do during spring break, and I don't want my son to see any of that. But who needs a beach? San Antonio is the seventh largest city in these United States, after all. There are tons of things to do here, including a Smithsonian, dozens of delicious restaurants, a championship basketball team, and a lovely riverwalk. We also have a Six Flags and a Sea World, as well as the ONLY amusement park built specifically for children with special needs, Morgan's Wonderland. 1. The Alamo. Think you know about the Alamo? I am here to tell you that there's much, much more to the story than what you've heard. It's required that every Texan make at least one trip to see the Alamo in their lives, to remind them of the sacrifices made by those that died in defense of Texas independence. Stepping inside the heavy wooden doors into the cool interior of this former mission is like a trip back in time. You can almost see William Barrett Travis, Davy Crockett, and Jim Bowie(no relation to David) planning their strategy to fight the advancing army of Santa Anna. There are still bullet holes in the walls, and even though most of San Antonio has sprung up around the site, archeologists are still finding fragments and relics of that forgotten time. Most kids love the story of Travis drawing a line in the sand, and there's other fascinating stories as well. 2. The San Antonio Zoo The San Antonio Zoo has been around for a very long time. It's also undergone some changes in how the animals are presented. There's a reptile house, which was my favorite. There's also a butterfly garden, where kids can see butterflies up close and personal. The zoo has a petting zoo, always a hit with the kids. Finally, they've been working on their exhibits of animals from Africa and have made the exhibits a little more interactive. The zoo will be much more palatable in the spring than in the summer, when it gets super hot. There's also a small train that travels through Breckinridge Park, and it has a station at the zoo. 3. Kiddie Park Playland Park, it used to be called. All the rides are built especially for kids. In fact, I don't think most adults can fit in those tiny seats, at least not without a crow bar. My dad took us there when I was a kid, and I spent almost two hours riding the small roller coaster. I had a blast just going up, around, and then down for two hours. I have no idea why. Kids enjoy repetition, I guess. At least I did. The Kiddie Park also has a train station for the Breckinridge Park train. 4. The Witte Museum The Witte is a museum, true. Museums are usually not for kids, with their extremely fragile displays and their longstanding "DO NOT TOUCH" policies. If you even think about touching something in one of these museums, a docent appears to scold you. But the Witte has made a special effort to draw in the kids with a special exhibit of animatronic dinosaurs and a "treehouse" just for kids to get their fun on. When we took Zane to see the dinosaurs, we had to drag him out of there, he was so entranced. 5. The Children's Museum Yes, Virginia. A museum built just for kids. This one has tons of hands on activities, such as a pretend grocery store equipped with cash registers and shopping carts, an old trolley car, etc. Children can get their hands busy playing at milking a cow or examining the water cycle. They can play with pulleys and levers and magnets, all in a safe environment where touching the exhibits is allowed. 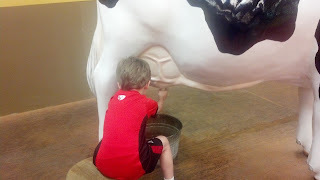 Zane loves the Children's Museum--and it's right around the corner from the Alamo! I love San Antonio! I have a degree in Latin American Studies, so we studied the Alamo from a different perspective one semester. It was so interesting to hear the Texan side & the Mexican side & just how different they are. Visiting there is sooo cool! Wow! So many things and so little time!! Sounds like you'll need WAAAAAY more than a week!